Trouble with this kind of journalese is the difficulty in relating cause/effect! 1. The software update must have been crucial to the mission’s success in returning science data to have been left so late in the mission. It is doable with ion thrusters, but it could take several decades to get to Pluto. 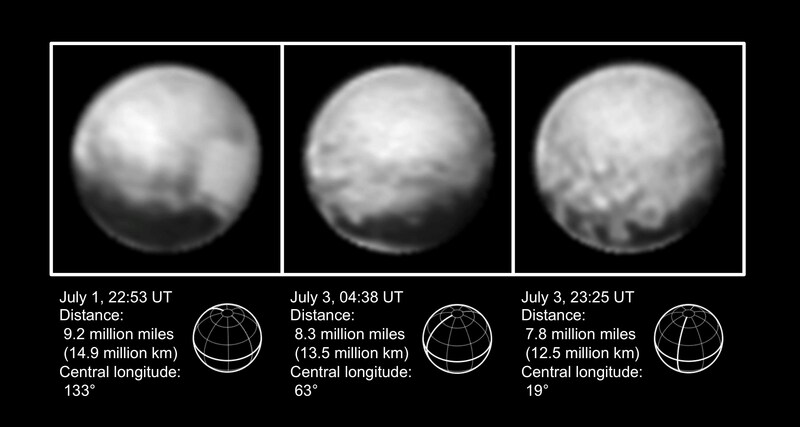 I think that next week is the only close look at Pluto we’ll have this century. It’s starting to look more and more like the moonface from “Le Voyage dans la Lune”. The four dark spots are obviously his eyes, nose and mouth. You can’t see the face clearly because we’re approaching from too far north. You would think NASA would have considered this before launching such an expensive spacecraft. Great that we’ve made it to Pluto. The dark spots on the Planet seem to me to be shadows; as there is correlating light spots above them. Even the Planet has the light coming from above. Can’t wait for the clear pictures. The ring on the lower right looks volcanic. You could imagine other frozen volcanos in these blurry photos. Is Pluto just a big orbiting comet which has had past eruptions on its surface? Probably just a photographic artifact but it looks like there’s an atmospheric haze around the planet. WHO will be the first to walk on Pluto? That will happen some day you know ~ Might just be that special someone will be named Neil? Try to imagine where humans will be in 100 years? or 1,000 years? and DO something about it! Let’s see if I have this right – the striped light/dark side’s picture is basically facing Charon which might be centered about 0° Long. The northern hemisphere right now is in semi-perpetual “summer” (though Pluto is itself moving toward aphelion and thus winter) is light colored and below the equator in semi-perpetual darkness the land is itself also dark, occasionally with less dark regions such as the striped lighter areas mostly facing Charon. In the northern hemisphere but near the equator on the Charon facing side there is some texture to the land – quasi circular regions that could be craters, volcanoes, or who knows what. To the East the land becomes less contrasted/textured broadly white (at this point.) Roughly on the opposite side of the planet the broadly white featureless area becomes less intensely bright generally, but opposite the stripped region facing Charon there is a broad bright white “square” region just north of the equator. South of the equator the deep dark region spreads out with a hint of white towards the south pole, but that could be atmospheric haze or a processing effect of the edge of Pluto. Ah – and the side opposite the stripes, the side facing Charon, will be opposite close approach of New Horizons. The broad sub-equatorial region is called “the whale” so far. And the striped region seems to ascend from south of the equator next to the bright equatorial region about opposite of Charon. That side’s highest resolution will be about 3 days before closest approach. The article kinda implies this could happen and maybe so. But so close to flyby and with 8.5 hours of transmission time each way, I know there had to be some, oh snap what the heck happened, panic in the command center. Glad they got it going again, looking forward to more photos of Pluto. Next PostNext Is Kapteyn B Not to Be?